It’s been a bit since I’ve written but that is no reflection of how much I’ve been thinking about you. There is no part of any day that you are not on my mind. Your memory lives there and is part of my every breath. And I’ve certainly not stopped talking to you in my quiet moments, most times out loud. Last weekend we held your annual Ride For Will and one thing I want to know is how much you had to do with that chaotic weather?? I know the large snowflakes that fell on Friday morning were you, always the teaser, the taunter, the boy who loved snow so much that given the choice of a warm sunny day, you’d take the snow every time. You got me as I looked out the window to see the white stuff falling and before I got my iPad and hit record video I swear I could hear your mischievous giggle… you know the one – the one right before the panic that got you running to my side for protection from your brothers when you’d pushed their buttons one time too many. Saturday started out so promising, so nice with the sun waking us that morning. You, little Mr. Blue Sky shining down on us as we set up for registration and put the tents up in the sports field to house the bake sale and the medics, the face painting and the PA system. “Just in case” is always our reasoning and because we all know that June in Southern Alberta can deal all kinds of weather my fingers and toes were crossed that you’d be the boss of the weather. This time, maybe that weather task was too big for you and next year, maybe you could ask the big guy up there for some help? I wonder, does the big guy trump Mother Nature? The good news is that nothing could dampen the spirit that surrounds your Ride. I am in awe at those that continue to support us through this event. The young and old, your school friends and ski buddies, family and friends, all those that gather in your memory and remember and those that didn’t know you, but feel like they do through your story and the good that we are doing in your name and your memory. It is a big bittersweet day for us; a day so full of love and missing you that no harsh weather could diminish. I couldn’t help but smile at all the muddy grins on faces dotted with mud and all the muddy stripes on the backs of the riders as they finished. For you, a bike and a mud puddle meant fun and it was evident that those that rode saw it that way too (or had no choice but to!). I love you little Mr. Blue Sky. Even when Mother Nature overrules you. I guess when it comes to the weather she really is the boss. Stay on her good side, Will, as she can be quite unpredictable! And that’s one mother that you don’t want to make angry! Love you like a bus rippin’ through the mud. 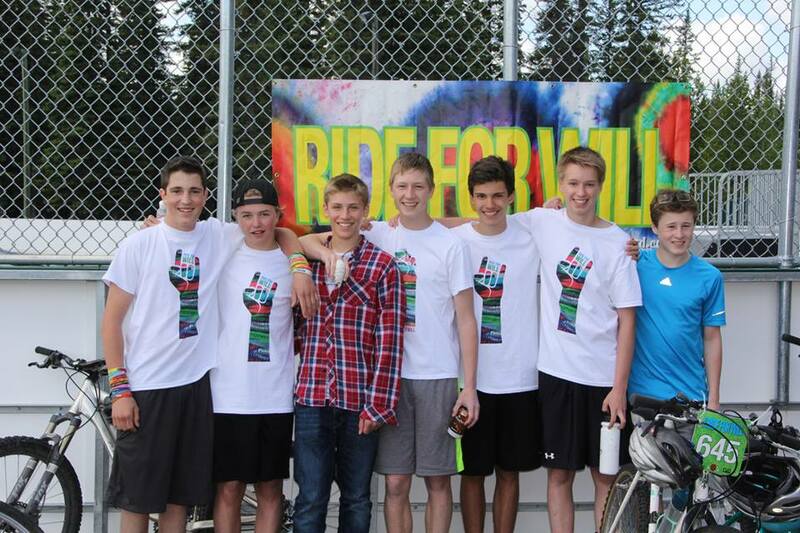 Will’s Friends Ride For Will! 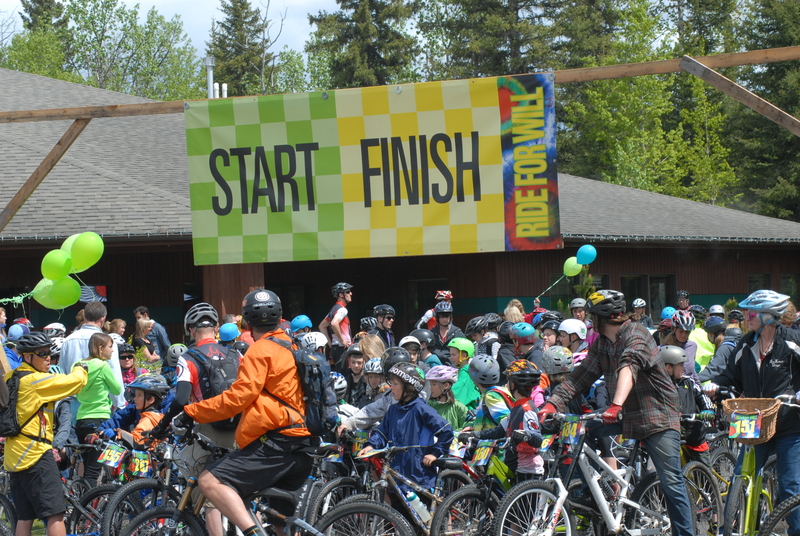 On Saturday, your Third Annual Ride For Will was held here in the community that was (and still is) your home. It was a beautiful day sandwiched between two rainy ones and my fingers were crossed, hopeful that you’d help out by keeping the rain away…. In the back of my mind I was preparing for a ten minute down pour at some point during the event, your signature “gotcha!” way of wanting to always have the last word, and in the end I was thrilled that you waited until we were safe inside. 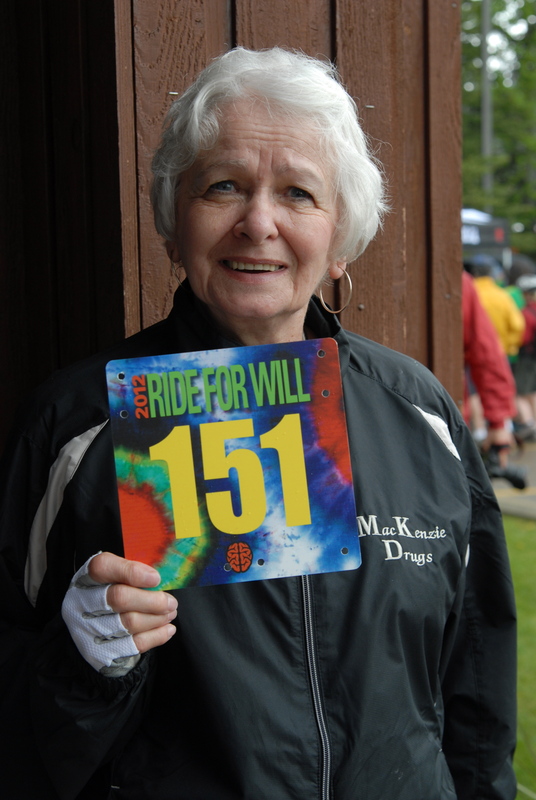 Three years and three rides have yielded almost $150,000 to your Foundation and I am still awestruck at what happens on this day each June that we call The Ride For Will. People, young and old, show up with smiles and pledges, with hugs and support, not only to benefit your Foundation, but to honor you and show their support for Dad and I and your brothers. It is a memorable and most beautiful bittersweet day that renews our hope that you will never be forgotten. To me, there is something timeless about a bike. The simple pleasure it provides and the freedom it symbolizes is a right of passage in our neck of the woods for each and every child that grows up in this community. 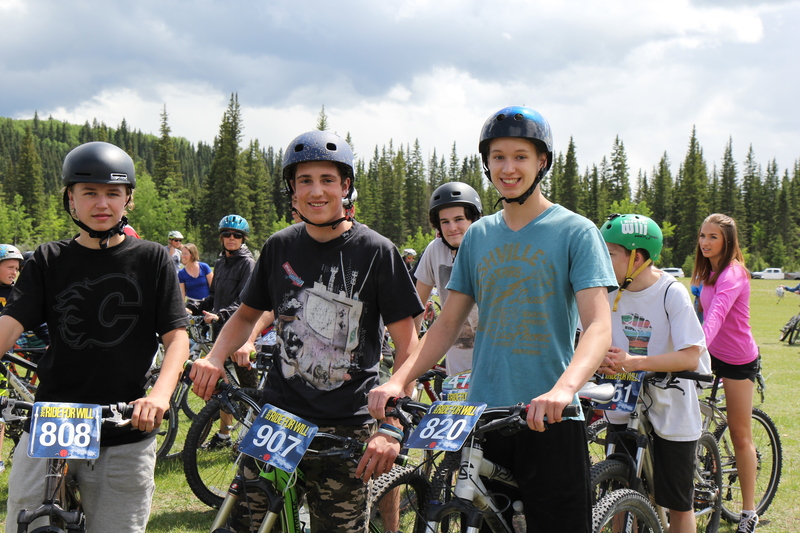 I will always remember the excitement that precluded any bike ride into Bragg Creek for icecream or candy and when you and your friends could do it without an adult ride-a-long, quite frankly, you’d hit the big time. Now, Will, your friends are driving to the city in their cars instead of packing their pockets with loose change to buy candy and icecream and that alone is difficult to accept at times. The passing of time is indeed a tough pill to swallow and I am quite sure it always will be. What is magical about your Ride is that your friends and people who didn’t have the chance to know you show up with their bikes, adorned with WillPower bands, and I Ride For Will stickers on their helmets and bikes. They ride and stop at the refreshment stations and fill up on free candy and freeze pops, pedal to the school and back passing all of the familiar landmarks that were second nature to you. When I see your buddies on their bikes they magically become twelve again and though you aren’t there, YOU ARE. I am hopeful that you will always be with them in some way. Whenever I see a boy on a bike, I am immediately thrown back into the many memories of you ripping out of the cul-de-sac with your pant leg tucked in your sock (if you weren’t wearing shorts!) in a hurry to meet a friend or two at the bike jumps or the soccer field or at a friend’s house to play. Those were the gifts of an ordinary day growing up here and memories that I will always treasure. It is no secret that you are in my thoughts every minute of every day, Will. My days begin and end with you and on Saturday, June 14th it was evident that you were on the minds of many who were there to support and remember and celebrate your life cut short. I know you were looking down on all of us with your big Willy smile and bluer than blue eyes. 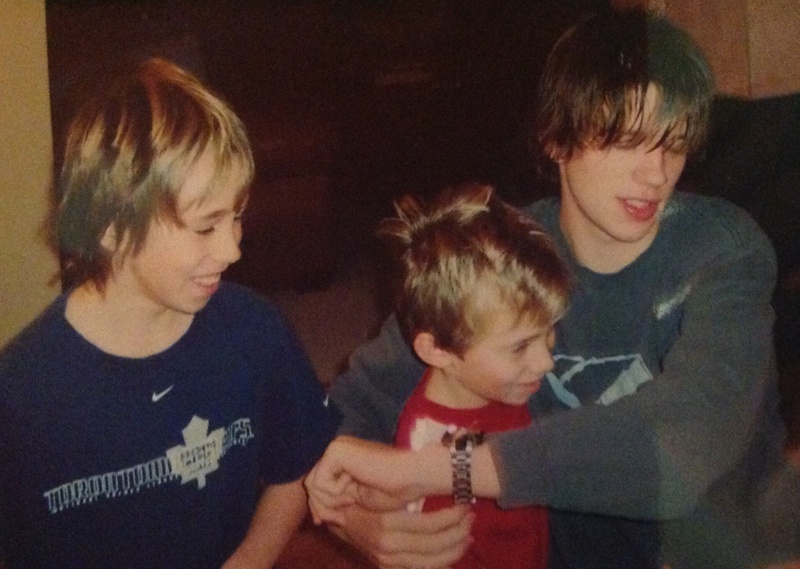 Since your tragic passing, it has always been our hope that something good could be born of something so tragic. There is healing for us knowing that in your memory what began as the simple pleasure of a bike ride has grown and taken on an identity of its own. The Annual Ride For Will allows us through your Foundation to make a difference in the world and that just feels right and feels good. Now as I bask in the afterglow of Saturday’s Ride For YOU my heart feels a little lighter and oh, so full. You, little Blue, are quite a boy.